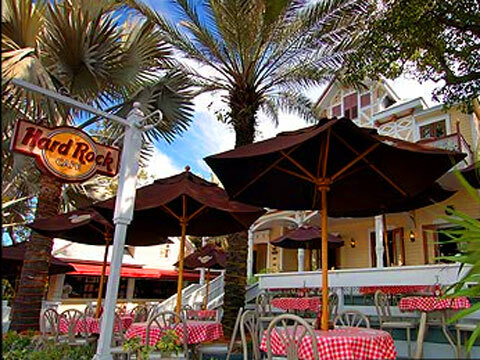 If the Hard Rock Cafe Key West were open in the early 1900's, you would doubtlessly have found Ernest Hemingway seated on the beautiful patio overlooking Duval Street. Quite possibly The Old Man and the Sea would have included a scene with the "Old Man" downing Floribbean favorites and ice-cold margaritas before embarking on his fishing excursion. Maybe his books would have contained scenes of bullfighters lounging around the bar, gazing at their favorite rock 'n' roll memorabilia before enjoying a Caribbean Bar-B-Q Sunset Sail aboard the Liberty Clipper (from November-May on Tuesday, Thursday and Sunday). Indeed, we can only imagine how the southernmost cafe in the continental United States would have duly changed literary history! Stationed in the heart of downtown Key West, legend has it that this old three-story Victorian style house is still haunted by the ghost of its original owner, Robert Curry, who meanders along the corridors of this unique cafe. We can't help thinking that if only he'd access our PX system, he could just relax! He'd be guaranteed a seat in our large second floor main room with a full bar and balcony as well as two smaller rooms. The Hard Rock Cafe Key West is your key to the Keys.